As soon as the first cover designs were presented for discussion there was a buzz about the main image. It is so unusual, enigmatic yet sinister, that it seemed perfect for the cover of A Habit Of Dying. Images are ten-a-penny on the web and many people ignore any form of copyright, incorrectly assuming that if a photograph is in the public domain then it is free for anyone to use. But the owner of this startling image was eventually tracked down and somewhat to her surprise asked if the image could be used. Thankfully, Rebeccah von Schlieffen consented, and with a little software photo magic that wonderful face has found its way onto A Habit Of Dying. A few readers may recognise the lady, but for most it will merely hint at someone they may once have seen. According to the old story, she was an anonymous young woman who in death came to be known as L’inconnue de la Seine, supposedly drowned in that river more than 100 years ago. Suicide or murder, tragedy or fantasy? 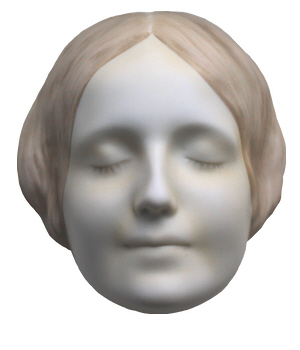 Fact and fiction have intertwined over the years (as they have a habit of doing) so that The Truth may never be known, but her death-mask became popular. So popular in fact that when a face was needed for the ‘rescue dummy’ to train first-aiders, the face of L’inconnue was chosen. When a second edition of the book was being planned, there was never any doubt that L’inconnue de la Seine would continue to be the face of A Habit Of Dying.